I listened to this audiobook as a download from Audible.com. I have a membership. 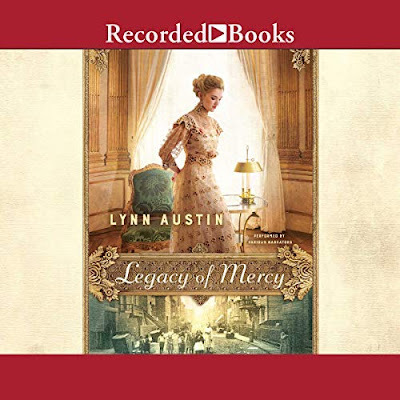 This is the sequel to Waves of Mercy by Lynn Austin. That story disappointed me with the ending, as it was basically a cliff-hanger with no resolution. So I thought I'd listen to this audiobook. At first, when I heard that it was done in first person POV (Point of View) I almost didn't listen. I do not care for first person POV. At all. Or so I thought. Because with six narrators, all excellent, and a lot of the story told almost like letters and with many flashbacks, I was able to deal with the first person POV. In fact, here's a situation in which the author likely really did need to use this method to get the story told. I really enjoyed this audiobook, which is saying a lot for someone who does not listen to first person story telling. This story does somewhat defy subgenres. It is a Christian historical fiction but it also has a strong Women's Fiction feel and there is definitely romance. There were some bibliotherapy elements that were strong -- with depression, suicidal ideation, serious illness, and more. Lynn Austin did a beautiful job of weaving God's mercy into the story. Since this is the Legacy of Mercy in the Waves of Mercy collection, that makes sense! If you've read the first book in the Waves of Mercy series you do need to read this book, too. It will take care of the cliff hangers and leave you satisfied with the story. The narration, story, and characters are all first rate. Highly recommend if you've already read the first book! Great review! I don't think I've read any of Lynn Austin's books. Thank you for a great review, Miss Carrie. Wonderful review, Carrie! I enjoy Lynn Austin's books.